A couple weeks ago, Personality Hacker released a podcast about personality types and religions. They spent much of their time talking about faith traditions in the United States and how different personality types gravitate towards different religious expressions. As an example, they talk about the personalities attracted by Baptist and Presbyterian faiths. FP types are more likely to gravitate toward the Baptist faith, which values “personal faith expression.” Since Presbyterians are “more organized as a collective” with “codified belief systems,” that tends to attract FJ and TJ types. TP types are the most likely to leave a religion, and don’t fall neatly into either of these example categories. It’s a fascinating topic, though at first it seems rather obvious. Of course different personality types are attracted to different types of religions. Someone who isn’t comfortable without outward displays isn’t going to join a Pentecostal group. Someone who hates rules and ritual won’t become Catholic. At Personality Hacker, they boiled it down to a question of whether or not your faith encourages and allows you to use the dominant aspect of your personality. ESFJs and ENFJs lead with Extroverted Feeling, and they’ll leave a faith tradition that doesn’t encourage harmony among the members. INTPs and ISTPs lead with Introverted Thinking, and they’ll leave a faith that doesn’t make rational sense. And so different types gravitate towards different religions, or move away from religion, when they aren’t allowed to be themselves. Let’s switch gears for a minute. One of the core aspects of Christianity is the belief that we’re right and everyone else is wrong. That’s overly simplistic, but if you’re a worshiper of the Christian God, then you also have to believe that He’s the only true God. Even the demons know this (James 2:19). There are other things that people worship as a god, but the Bible is very clear that 1) Christians shouldn’t run after other gods and 2) those “gods” aren’t on anything like the same level as our God. This might be the least talked about truth in Christianity. We don’t want to offend non-Christians and we’re not sure how to handle doctrinal conflicts with other Christian groups. So we talk about finding the religion that “works for you,” or a “faith tradition that expresses who you are.” If really pushed to admit it, though, I think most Christians will say they believe their particular brand of Christianity is more right than the others. Jesus Christ isn’t the Head of many different churches, though. He’s the head of one true Church which is composed of His called-out people scattered throughout many different groups. There are many groups out there who claim to be part of this one true church, but are they? What does a true church look like? As I think about the topic of personality types in religion, I’ve reached a sobering conclusion. 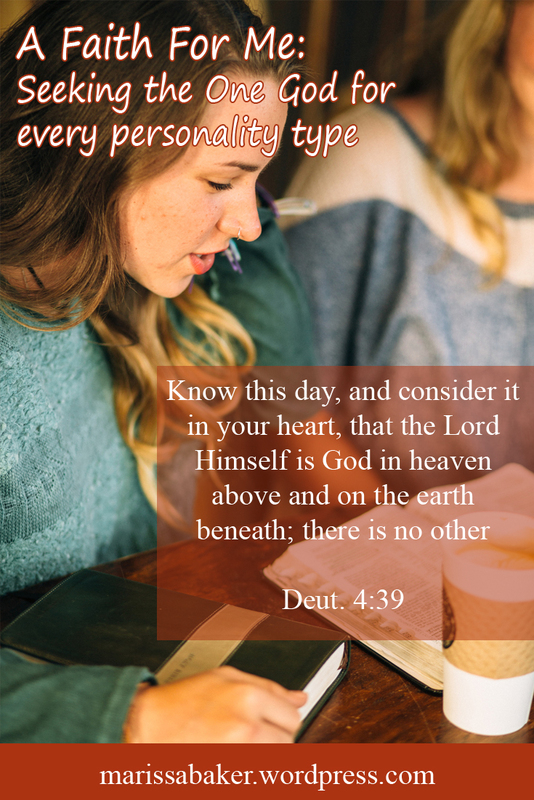 If your brand of Christianity is driving a certain personality type away, there’s something wrong with it. We tend to assume that if people are leaving church there’s a problem with them, and in some cases that may be. However, if all INTPs and INTJs (or any other personality types) are leaving that means this particular church is failing to engage a group of God’s children. 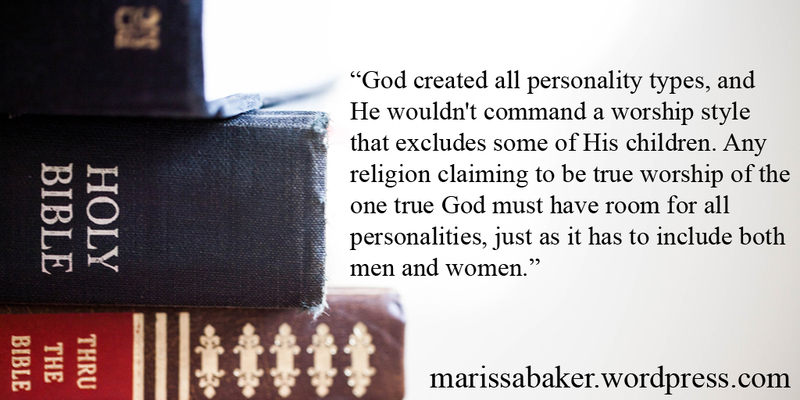 God created all personality types, and He wouldn’t command a worship style that excludes some of His children. Any religion claiming to be true worship of the one true God must have room for all personalities, just as it has to include both men and women. God wouldn’t give people a personality type that isn’t compatible with worshiping Him, so if certain types are driven away because they are not “respected, honored or allowed to” use their gifts, then there must be something wrong with how we humans are constructing our churches. I wholeheartedly agree. I get very annoyed at the science vs religion debate, when in my opinion, nothing makes more sense than God having created the world so it works the way that it does (duh…?) My church’s head pastor is even an INTP, pretty sure. My husband is an ENTJ, and he left Catholicism, but is now very much anti-denomination because he thinks it is unbiblical. Faith has nothing to do with feelings. interesting! i understand where your husband is coming from. but being anti-denomination, it’s hard to find a church and community to fellowship with right? i’m struggling to find a church to fellowship with fellow believers because i find that i can’t wholeheartedly agree with every single creed or belief (apart from the basic nicene creed). Love your thoughts here! I listened to that podcast as well and it really got me thinking. Great post! i really wish i could find a community of believers where i live that i can wholeheartedly be a part of. i’ve been studying the history and different denominations of christianity. i find that there’s no one denomination that i agree with fully. i identify with some parts of methodism but not every creed they subscribe to, similarly for seventh day adventist and pentecostal etc. for example, i’m not convinced about why sunday is the day of worship but at the same time i find it a little legalistic the way SDAs view the sabbath and i’m unsure how to feel about the doctrine of investigative judgement and the view of ellen white. i agree with methodism and most of their theology, except that through my research thus far, i hold to conditional immortality. i find catholicism beautiful but i believe in the priesthood of all believers and i don’t agree with some of the catholic practices. Yet at the same time i find that some protestant churches take the “not saved by works” idea too far and in a too simplistic manner such that it tries to ‘explain away’ certain difficult verses when it comes to soteriology and eschatology. i think the truth is more nuanced and lies somewhere in between. i find that God’s ways and intelligence is far beyond what we can grasp fully. if anyone can relate, do you have any advice on what i should do when it comes to finding a community? I can definitely identify with feeling like God’s truth is more nuanced than the creeds of many Christian groups. It’s like we humans want to put Him in neat little boxes, but He defies simplistic categorization. I currently attend with two groups each Sabbath, partly because I feel like both together is closer to what I think the truth is than either one is separately.